Seville - Sevilla produced a stunning fightback from a three-goal half-time deficit to earn a thrilling 3-3 draw with Liverpool on Tuesday thanks to Guido Pizarro's stoppage-time equaliser. Roberto Firmino scored twice as Jurgen Klopp's side looked set to qualify for the knockout stages for the first time in nine years and seal top spot in Group E with a three-goal blitz in the first half-hour, with Sadio Mane also netting. However, Wissam Ben Yedder pulled two goals back before Pizarro stabbed home from a corner to protect Sevilla's year-long unbeaten run at home. 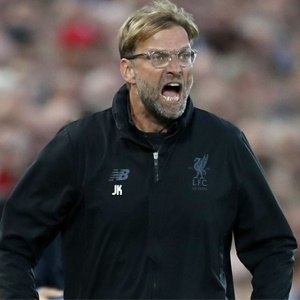 "Fantastic first half and in the second half we made the mistake that we didn't continue playing football," said Liverpool manager Jurgen Klopp. "We have to control the game with the ball and we didn't play football. "We became a little bit passive, they scored the first one and it was obvious the atmosphere changed immediately and that gave them a big boost." Both sides remain well-placed to reach the last 16 as Liverpool still lead the group on nine points from Sevilla on eight with Spartak Moscow in third on six points. Liverpool host the Russians at Anfield in two weeks' time when Sevilla travel to Maribor for the final games in the group. "It was an incredible game. I am really emotional about what happened," said Sevilla coach Eduardo Berizzo. "I am delighted for my players, for the reaction and the pride they showed." Both sides were gifted a huge boost before kick-off as Maribor's stoppage-time equaliser for a 1-1 draw in the Russian capital prevented Spartak from jumping into second place in the group. Sevilla's joy didn't last long, though, as they were punished for awful defending from a corner less than two minutes in when Firmino was left completely unmarked at the far post to fire high past Sergio Rico. The hosts had their chances to get back into the game when Loris Karius got a fingertip to Nolito's goalbound effort to turn the ball onto the post before Ben Yedder fired inches wide with just the German goalkeeper to beat. Yet, the pace of Liverpool's 'fab four' attack of Firmino, Mane, Mohamed Salah and Philippe Coutinho looked capable of opening up the Sevilla defence at will and only a fine save from Rico prevented Firmino from doubling his tally midway through the half. That save only delayed a two-goal Liverpool lead by a matter of seconds as, from the resulting corner, Mane scored almost a carbon copy of the opener when he stooped to head home Firmino's flick-on. Eight minutes later it was 3-0 as Mane sped away from a lumbering Sevilla backline and his initial effort was only parried by Rico into the path of the grateful Firmino to slot into an empty net. Sevilla came out a side transformed in the second half and were given a lifeline when Ben Yedder got across his marker to head Ever Banega's free-kick inside the far post. Belief was coursing through the home side and fans moments later when Ben Yedder went down under a challenge from former Sevilla favourite Alberto Moreno and German referee Felix Brych awarded a penalty. Ben Yedder stepped up and slotted home from the spot twice after Brych ordered his first attempt be retaken. Liverpool produced the most unbelievable fightback from 3-0 down to win the Champions League against AC Milan back in 2005 and Sevilla were inches away from their own Istanbul moment 25 minutes from time when Franco Vazquez's shot was turned onto the underside of the bar by Karius. Klopp restored some order to the visitors with the introduction of Emre Can and James Milner for Coutinho and Moreno and Liverpool should have settled their nerves with a fourth goal as Salah, Mane and Can all passed up big chances. And they were made to pay for their profligacy and poor defending when Pizarro stretched to turn home a loose ball after a corner wasn't properly cleared in injury time.